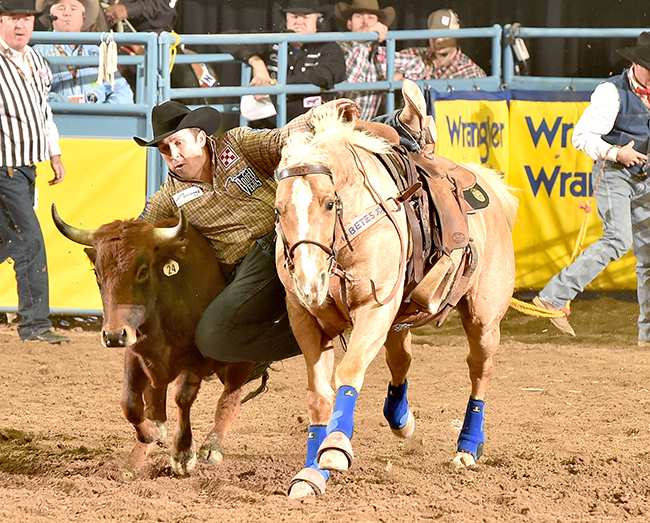 LAS VEGAS – The City of Lights roller coaster continues for steer wrestler Riley Duvall. On Friday night, the Checotah, Okla., cowboy wrestled his steer to the ground in 3.6 seconds to win the ninth go-round of the Wrangler National Finals Rodeo. He also grappled away $26,231 for the victory. He should be. The 24-year-old bulldogger is playing on ProRodeo’s grandest stage for the first time. He finished in a three-way tie for sixth place in the fourth round, then was part of a three-way tie for first place on Round 6. In all, he has earned $58,513 in nine nights and has pushed his season earnings to $119,690. Better yet is that he has one more chance to add to it when the season comes to a conclusion with the 10th round Saturday night. Riding well and pushing the limits for big money worked once, so he’s going to do it again on the final night. “I’m going to go as fast as I can, hopefully on a good steer, and try to do the same thing we did tonight,” said Duvall, who is the fifth man in his family to compete at the NFR, including his father, Sam; uncle, Spud; cousin, Tom; and great-uncle, Roy. “I want to try to get a little confidence going for next year. It’s been a little bad the last two nights, so tonight was needed. As with any job, earning as much money as possible is vital. For someone who competes in rodeo, there are no guaranteed salaries, and the only income occurs when competitors do better than most in the field. With a chance to earn more than $26,000 ahead of him Saturday night, there’s no reason to hold anything back. “I’ve got a wife and kid at home that like to buy a lot of clothes, so I have to try to get all the money I can,” he said with a laugh. That’s the right attitude to have going into the NFR’s 10th round.